do you have a before picture of it? where are the plastic links located on the tr? Quick question…..you only show two 91mm threaded pipe for the lower links. Is the parts list wrong? That parts list is correct. We sell our links in packages of two, so 2 packs will give you 4 links total. does this mod change the wheel base at all? No, this will keep the wheelbase the same as stock. thanks for the reply on that Bender, also wanted to ask if the cgr blazer body from pro line would match up with the wheelbase on this truck. The CGR body is meant for a rig running about a 12 1/2″ wheelbase. So, it won’t be a very good match for the TR unless you lengthen the wheelbase. thanks for that info to bender. finally got mine ordered cant wait to get it and take it for a spin hope the electronics are pretty good out of the box. It depends, if you are running our stock ESC, then I wouldn’t go much lower then 27t. I know there is currently an aluminum link upgrade kit in grey color. Is there an option for different colors, or is it possible to piece together the aluminum links in a color other then grey? The link pack only comes in grey. You would have to piece together the link pack yourself if you wanted a different color. Do you know if all of the necessary links come in the additional colors? I can’t seem to find a colored 6x93mm pipe other then grey?? Good night. Why you did not use a 6mm spacer in the 4 link conversion (rear upper links). the 4 llink hardware move too close to the rear shocks and the drivrshat angle looks wierd, my driveshaf ring hits the rocks too easy. We don’t make a 93mm link. We have the stock SCX10 lower link length of 91mm in grey only as far as I can tell. Our 98mm links are available in all colors, you could buy those and trim them back to the exact size you need. The SCX10 RTR’s are tough to beat. They are strong, reliable and easy to tune. if i see the bumper, the picture is dingo 11.4 “, so the list of part is for 11.4″? 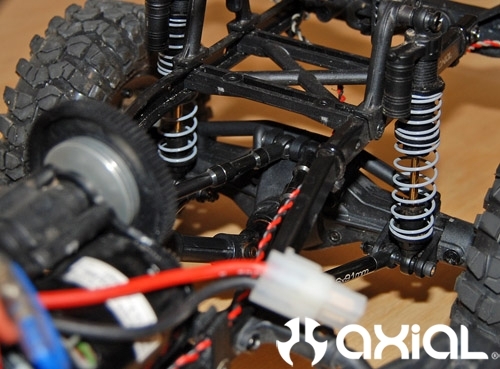 The RTR dingo is came with aditional part (4 links etc), which part that I SHOULD NOT buy? 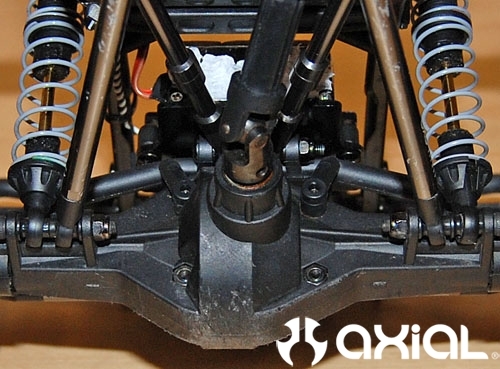 I have a question regarding the Axial 30550 Aluminum upgrade kit. I attempted to install this kit last night on my SCX-10 and for some reason I could not understand which lower links to use on the front and which ones are for the rear. Can you please help me determine which size goes where? I would greatly appreciate any advice possible! Also, I decided to go with the 4-link setup on the rear and the 3-link in the front… Im wondering if maybe thats where I made the mistake… any clarification would be awesome! 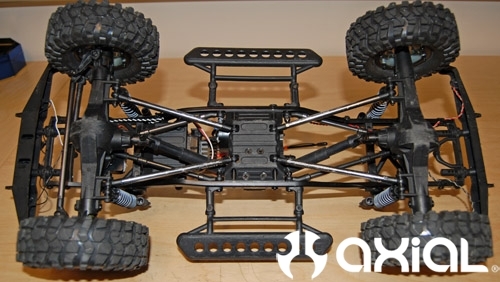 I have the SCX10 honcho kit, but I want to know how can fit a proline chevy blazer because it’s a different wheelbase what parts do I need to make it fit. The wheelbase on the Honcho may be a little long for the CGR body. Shortening the rear links will fix that though. 98mm links are stock in the rear for the Dingo. Switching to those new lower links, and removing the spacer on the upper 3 link should get you where you need to be. Hello Rene, sorry I missed this question the first time. I have run a few of my trucks with the 3 link out front and the 4 link in the rear, and it works great. For the Honcho you want the 106mm link on the rear lowers, fronts lowers will be 98mm, and the steering tie rod will be the last 106mm link that is included in the kit. Hope that helps. What are the 7x60mm posts for? They end up being the upper links. There are 2 to each package, so you will need two packages to complete the conversion. So to convert the honcho to dingo links,for shorter wheelbase can’t I just order the axial aluminum links upgrade kit? You can order the shorter 11.4″ aluminum links kit to convert from a Honcho wheelbase to a Dingo wheelbase. Just got the Rubicon scx10, was looking for a step by step process and all parts needed to do the 4link up front. Thanks for the help.